Silverline Towing has already built a reputation for excellence in the Hayward area — but now we’re bringing our professional towing and roadside assistance solutions to drivers across Oakland, CA too! We’re here to help you get back on track in a huge range of situations, from flat tires and dead engines to battery jump starts. We work with a network of independent tow truck operators who are dedicated to delivering the best service, no matter how big or small the job! At Silverline Towing, we offer an extensive roster of services to suit drivers facing all types of vehicular challenges. Being caught up in an accident or experiencing a mechanical fault is a major frustration, with the potential to disrupt your schedule, affect your work and even make emergency situations even tougher. And the worst thing? This can happen to you at any time, day or night. But don’t worry: Silverline Towing is available 24 hours a day, 7 days a week, 365 days a year! 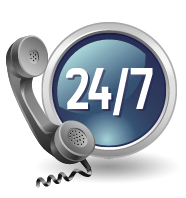 No matter the hour, no matter the place in Oakland, CA: just pick up the phone and we’ll send one of our independent tow truck operators to help! Silverline Towing works with local tow truck drivers and technicians who know Oakland well. They have the experience and familiarity with Oakland’s roads to find the fastest routes to you, meaning we’ll work to keep your wait as short as we possibly can. We know just how important it is to see a friendly face and feel you’re in good hands following an accident, a breakdown or other vehicular problem. You want to know the experts are on hand to fix the problem and answer all your questions. Our team is passionate about providing you with all the information you need when you call, and each independent tow truck operator in our network has the most in-depth training to service vehicles of various makes. They carry cutting-edge tools and equipment, while all trucks are maintained to the highest standards. As we’re a local company, we care about being part of the community and serving drivers to the best of our abilities. This helped us achieve great results and establish long-standing relationships with our valuable customers in Hayward — and we hope to do the same right here in Oakland! Unlike some other towing and roadside assistance firms, we strive to keep our rates as affordable and competitive as possible. Why? Because we believe every driver deserves professional help from the experts, regardless of your budget. We believe great service, a courteous attitude and reliability shouldn’t have to cost the earth. Our pricing is always reasonable on every job, and we’ll offer a trustworthy quote when you call. There are no hidden charges to worry about! Again, it’s all about being a local towing company people can depend on: when you know you receive terrific service at a fair cost, why call anyone else? Remember: Silverline Towing is here 24/7 to send an experienced, trained tow truck operator to you anywhere in Oakland, CA. Flatbed towing, long distance towing, gas refills, motorcycle towing, car lockouts — all these and more are available right now! So, what are you waiting for? Just pick up the phone and call us to learn more about our towing and roadside assistance solutions!